Celtic Tara brooch is a gold plated design that features multi colored stones along with a filigree motif. Sorry, this Celtic brooch is now sold out. 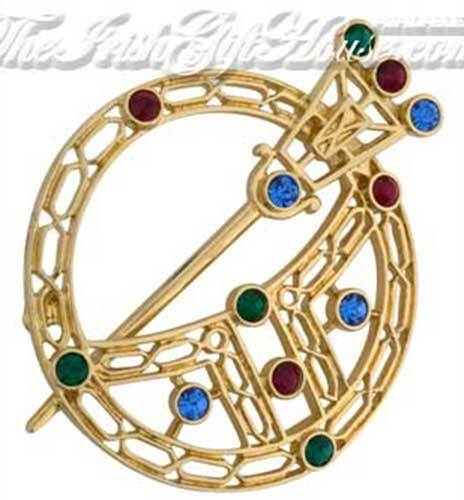 This gold plated Celtic Tara brooch is accented with multi-color glass stones in its open design; it measures 2” long. The Tara brooch is made by Solvar Jewelry in Dublin, Ireland and is gift boxed, complements of The Irish Gift House. Tara brooch is a gold plated design that features embossed Celtic knot-work along with multi-color glass stones. Claddagh brooch is a gold plated design that features Celtic knot-work and is fashioned in the Tara motif. Celtic brooch is a gold plated Tara design that features multi-colored stones. Celtic Tara brooch is a gold plated design that includes multi-color stones.